The trick to having a good looking beard doesn’t lie just in the proper beard care products, although they are very, very important (healthy beards don’t exist without them). Sooner or later, more likely sooner, you will have to trim your beard because, in most cases, unruly beards have to be dealt in the good old fashioned way. This is where your search for the proper trimmer begins and we are going to help you with it. 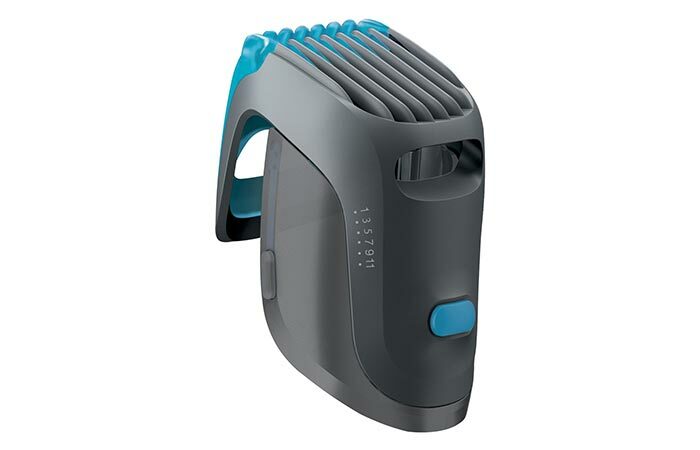 Braun has for years made superb hair and beard trimmers and they continue to do so, which is precisely why we are going to present you the Braun Cruzer 5 Beard from Braun’s Cruzer Beard & Head series, a trimmer which will tame your unruly beard without issues. Literally the best feature in the Cruzer series is the removable beard/hair comb (in the case of the Cruzer 5 Beard it’s the beard comb) which boasts six different beard lengths, so everybody who uses this beard trimmer can set it for either their long beard or their stubble. Whichever the case may be, this trimmer will effortlessly shorten your beard and obliterate any and all unruly hairs. More importantly, there will be no snagging which is a common issue with most trimmers and with guys who have thicker beards. If you are going for the shortest length, simply take off the beard comb; it’s design allows for easy removal. Made from several types of textured plastic for a decent grip, this beard trimmer’s weight will make handling very pleasant. Maintenance of the Cruzer 5 Beard is also a breeze. Run it under warm water to get most of the hairs out of it. The blade portion can be opened so that part of the trimmer can be ran under water too. The small brush, which you receive with this trimmer, will let you take care of any hairs which were left behind after rinsing it. If you are looking for an easy-to-use, affordable and very efficient beard trimmer, then Braun Cruzer 5 Beard should be your go-to trimmer. Of course, the Cruzer Beard & Head series offers several other trimmers which are also noteworthy, but that’s a story for another time.